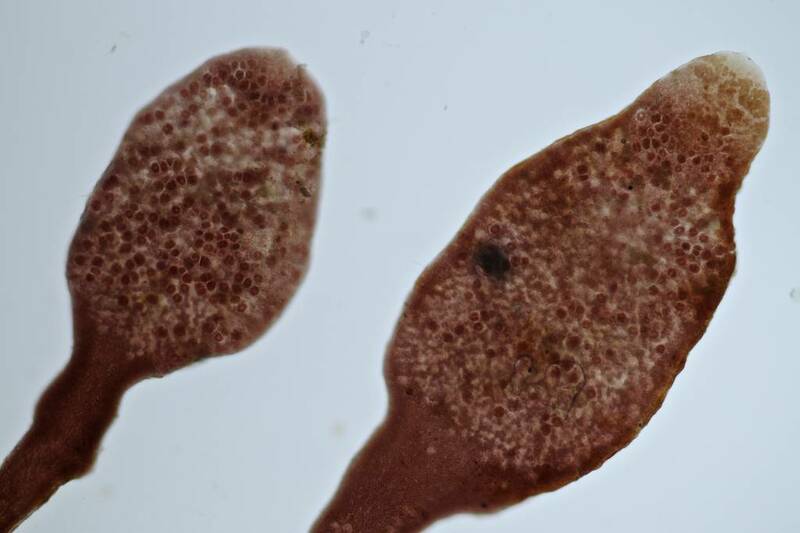 Description: Cartilaginous, brownish-red or purplish-red when wet and black or blackish-red when dry, turf-forming, 2-10 mm high, arising from an extensive creeping base and incorporating shell debris, crustacea and small gastropods. Erect and reproductive fronds flattened and leaf-like and 0.5-2 mm broad; apices spoon-shaped where tetrasporangia are being formed (above in the wild, and below). Tetrasporangia initially in fairly regular rows, later becoming scattered (dark dots below). Reproduction is mainly in winter. Habitat: On rock in upper intertidal forming extensive mat-like growths just below Pelvetia canaliculata, particularly on vertical or near-vertical surfaces; extending lower on the shore in wave-sheltered habitats. Often associated with Catenella caespitosa and Rhodochorton purpureum. Widely distributed, common. Similar species: Catenella caespitosa also forms turf- or mat-like extensions but is softer has has the appearance of small cocktail sausages. 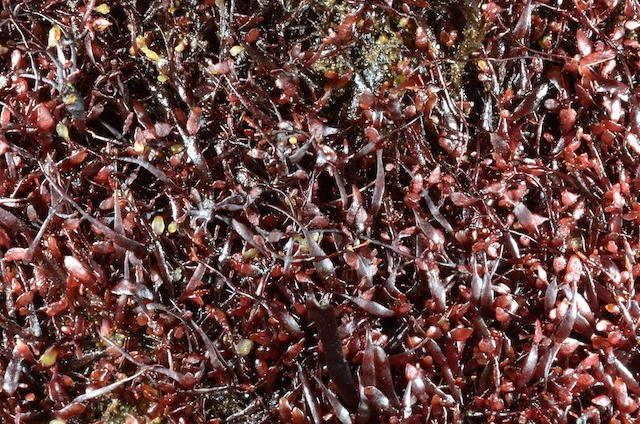 Key characteristics: Turf formation in the upper intertidal, blackish-red colour when dry, extensive rhizoids, and flattened reproductive fronds. Distribution: Probaly confined to the NE Atlantic from Norway south to Spain and Morocco. 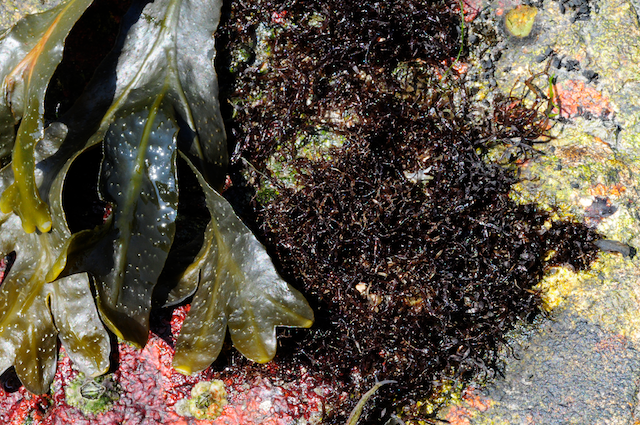 Note: The name Gelidium pusillum is applied to upper intertidal, mat-forming Gelidium species in temperate regions worldwide. It is now certain that a complex of unrelated species is represented, and the species is actually confined to the NE Atlantic. In this latter area the problem has been further complicated by the historical inclusion of a further group of unrelated species such as Gelidium pulchellum as part of the "morphological variation" of G. pusillum. A mat-, or turf-forming growth habit has evolved separately in many species complexes worldwide in the genus. Site © M.D. Guiry 2000 - 2019. Important copyright notice: all text, design and photographs on this site are copyrighted by M.D. Guiry unless otherwise stated and all rights are strictly reserved. Click here for copyright information and contact. Website design: 249 Design Studio. Site maintained by M.D. Guiry (michael.guiry@nuigalway.ie). There have been 8736614 page loads since 1 January 2014 on 25 April 2019.